Bronx, NY, March 9, 2017—Felix Storch Inc. (FSI), a manufacturer and distributor of specialty appliances, has upgraded its ISO certification from 9001:2008 to the newest quality management standard, 9001:2015. The company has been serving the residential, medical, commercial, and hospitality markets since 1969 and received its initial ISO 9001:2008 certification in 2015. To obtain ISO 9001:2015 certification, FSI’s management and administration system was evaluated by QAS International, a certification system that has been operating internationally for over twenty years. FSI was approved as an OEM manufacturer of specialty major appliances for the medical, commercial, hospitality, and residential markets. ISO 9001:2015 is the latest of the 9001 quality management standards set by the International Organization for Standardization (ISO). The newest standards include a greater emphasis on continuous improvement, leadership engagement, risk assessment, and supply chain management. In addition to ISO 9001:2015 certification, FSI’s calibration laboratory under its Accucold medical division has ISO/IEC 17025:2005 certification through Perry Johnson Laboratory Accreditation, Inc. This laboratory is used for calibrating temperature monitoring equipment for medical, scientific, and commercial refrigeration markets. Bronx, NY, October 17th, 2016—Summit Appliance introduces a new line of silent minibars designed and priced to offer huge advantages over standard absorption units. 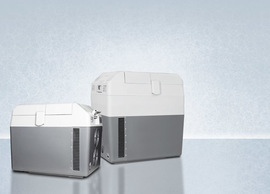 Using an innovative Peltier heat pump system, the MBH series provides an environmentally friendly, energy-saving alternative for the hotel industry at an even lower cost. Known for its extensive lineup of smaller kitchen appliances, Summit has a long relationship with the hospitality industry, often furnishing complete hotel suites with ranges, refrigerators, cooktops, and microwaves. After years of offering absorption minibars, the Bronx-based manufacturer is now looking at more efficient alternatives. "Many of our hotel customers demand noiseless refrigeration, which you can’t achieve using a compressor-based refrigerator. On the other hand, silent absorption minibars pose some risk due to the dangers of ammonia they use in their cooling system," says Paul Storch, president of Felix Storch, Inc. "Our solid state thermoelectric models produce the same silent result as absorption units but with safer, greener construction." Based on laboratory tests, Summit’s MBH series of solid and glass door minibars uses 30% less energy than absorption models. Because these units do not contain any fans or other moving parts, the vibration-free operation is absolutely silent, while the cooling system utilizes non-CFC-containing materials for a smaller carbon footprint. 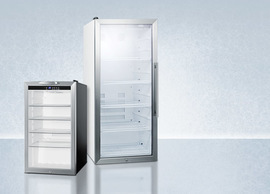 Summit’s MBH minibar series is now available. To learn more, visit www.summitappliance.com/minibars or call 1-800-932-4267. Bronx, NY, August 9, 2016—Accucold, a division of Felix Storch, Inc., has launched a new mobile-friendly website design for its medical, laboratory, and scientific refrigeration product line. 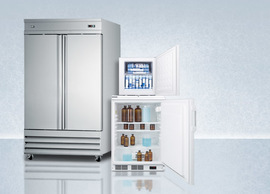 The new version of www.medicalrefrigerators.com was developed to create an easier customer experience in navigating the company's large product catalog, as well as provide various resources for the laboratory refrigeration industry. 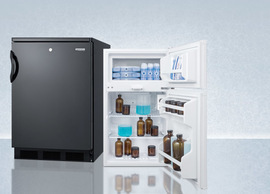 Accucold specializes in manufacturing refrigerators and freezers for a variety of healthcare and scientific applications, from general purpose use in staff rooms to vaccine storage in hospitals. The website organizes the product catalog by application to help guide users to the proper feature level. All product categories include multiple search filters to enable users to narrow down their product choices to their exact specifications. 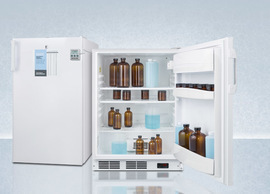 "The institutional refrigeration industry covers a very diverse range of products and applications," says Paul Storch, President of Felix Storch, Inc. "Our medical division website has been designed to meet the needs of a variety of customers, from pharmacies that need a compact locking refrigerator to laboratories searching for freezers than can store biological samples at ultra low temperatures." The website also includes products from Felix Storch, Inc.’s PureTherm division of warming cabinets. 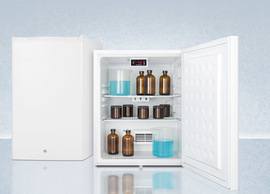 In addition to the new layout, the website also includes several resources for medical refrigeration users including temperature conversion charts, FAQs about vaccine storage, and best practices for using institutional appliances. To learn more, visit medicalrefrigerators.com. Bronx, NY, January 17, 2016—Temperature logging is more convenient with Accucold by Summit Appliance’s newest USB data logger. The NIST calibrated DL2 allows users to set their own recording intervals and includes added user-friendly features for easier monitoring. 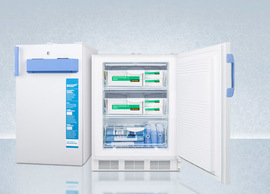 Designed for use with refrigerators or freezers, the DL2 is calibrated in an ISO/IEC 17025:2005 certified laboratory. The logger is accurate to .5ºC when recording temperature in a unit that runs anywhere between -10 to 10ºC. Data is recorded to an included 4GB USB flash drive that allows users to track and analyze temperature using any PC or Mac-based software. 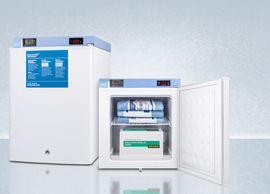 For added monitoring convenience, the DL2 includes a user-programmable high/low temperature alarm and a digital readout of the temperature viewable in Celsius or Fahrenheit. "Several years ago, we introduced a USB data logger that allowed our customers to record all temperature data to a USB flash drive," says Paul Storch, President of Felix Storch, Inc. "Our customers loved the functionality, but requested a few added features and more recording flexibility. We incorporated their feedback into the new design to create the perfect logger to meet those needs." The DL2 can be factory installed on any Accucold appliance or ordered separately for aftermarket installation as the DL2Kit.The actual logger is sized less than one inch in height so that it can be placed on top of a refrigerator installed under a counter. To learn more, visit www.summitappliance.com/datalogger or call 1-800-932-4267. Bronx, NY, November 17, 2015—Architects and interior designers are finding new ways to give homeowners a full kitchen in less than half the space. Summit Appliance, a division of Felix Storch, Inc., produces a complete line of appliances designed for tiny and micro-kitchens. 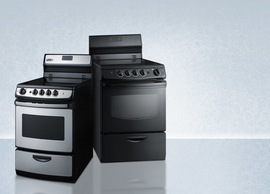 From thin-line refrigeration to induction cooktops and even a new speed oven, Summit Appliance specializes in creating space-conscious appliances that offer full function and capacity. They offer a diverse line of refrigerators and matching frost-free freezers sized from 15” to 24” wide that can be installed under counters or in stackable space-saving sets. 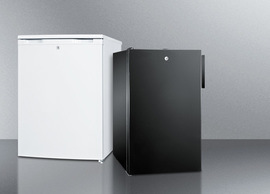 Slim upright refrigerator-freezers with unique counter depths are also available to give modern and traditional options based on the size and layout of the kitchen. Summit Appliance’s most popular undercounter units, such as the 18” wide FF1843B refrigerator and matching SCFF1842 freezer, are offered with several finish options to best match any kitchen design. Choices for the undercounter line include white, black, stainless steel, and panel-ready options. 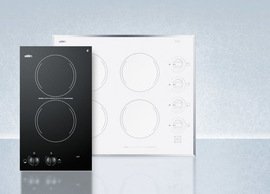 In addition to Summit’s slim refrigeration line, other uniquely sized appliances include 18” wide dishwashers, 20” and 24” wide ranges, and 12” wide induction, electric, and LP or natural gas cooktops. The newest addition to the line is the CMV24, a 24” wide built-in speed oven that allows space-challenged kitchens to have a microwave, convection oven, and grill in one unit. For laundry needs, Summit offers several all-in-one washer/dryer combinations. To learn more about Summit’s small kitchen line, visit www.summitappliance.com/microkitchen or call 1-800-932-4267. Bronx, NY, September 20, 2015—Summit PureTherm, a division of Felix Storch, Inc., introduces a dual purpose solution to warm and cold storage with a new line of combination warming cabinet and refrigerators. 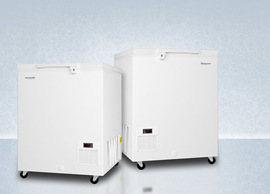 Designed to keep blankets heated while also chilling refrigerated or frozen items, these units create an energy and space saving solution for small medical facilities. Available in five configurations, the PureTherm combinations are sized with a 24” footprint to conserve floor space in small hospitals, physical therapy clinics, and doctors’ offices. A glass door warming cabinet is securely installed on top of either a refrigerator or freezer. When the unit is running, heat generated by the compressor is channeled upwards to the warming cabinet to keep the interior at 140ºF. “Every refrigerator produces heat, which is typically just wasted into the air,” says Paul Storch, President of Felix Storch, Inc. “We created a system of utilizing that waste heat to power the warming cabinet. Essentially, you get the functionality of two separate appliances using the energy of just one. ” A small heating element is also included in the upper chamber to provide backup power when the compressor is not running. Felix Storch, Inc. (FSI), was founded in 1969 as a manufacturer and distributor of specialty major appliances. Through its Summit Appliance division, it now specializes in residential refrigeration, cooking, and laundry products, with a strong focus in undercounter and ADA compliant appliances. Summit Commercial caters to the commercial foodservice market. 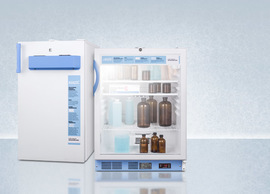 For medical and hospital grade appliances, FSI serves the market through its Accucold and PureTherm divisions, with an ISO/IEC 17025:2005 certified calibration laboratory. In 2015, FSI achieved ISO 9001:2008 certification. Bronx, NY, August 21, 2015—Summit Appliance presents a new way for hotel guests to manage their in-room refrigeration settings with the HBOX168, an external power source that controls the refrigerator’s compressor. 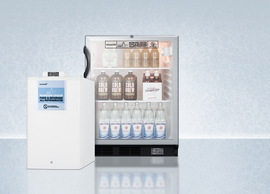 The HBOX168 was designed to work with most refrigerators, giving hotel guests the option of how they want their unit to run. There are three options provided with the HBOX168: Normal mode, Off mode, & 16/8 Sound & Sleep Saver mode. Normal mode allows the unit to run regularly, Off mode completely disables the fridge, and 16/8 Sound and Sleep Saver mode turns the unit off at 11pm and resumes standard operations at 7am. The result of the fridge being shut off during that time frame helps to reduce energy consumption by up to 33%. The HBOX168 comes in a jet black finish with an LED display for the time and operating mode. It can be ordered with virtually any Summit Appliance, or ordered separately for use with other brands. To learn more about Summit’s HBOX168, visit www.summitappliance.com/catalog/model/HBOX168 or call 1-800-932-4267. Bronx, NY, July 23, 2015—Summit Appliance, a division of Felix Storch, Inc., has launched a brand new website for its residential and commercial product lines. The new design of www.summitappliance.com is intended to make it easier for users to navigate the extensive catalog. Additionally, the site offers more product information and new user-friendly resources. In the last few years, Summit Appliance has expanded its product offerings and now carries the largest selection of built-in undercounter and ADA compliant refrigeration in the appliance industry. In order to improve the user experience in exploring these product lines, the new website was redesigned with a strong emphasis on detailed product filters. Additionally, the site incorporated an auto-fill search box for users to locate products or categories more easily. Other features include downloadable product brochures, a troubleshooting section, online request forms for service and parts, and informative articles on product use. "Our previous website was a great tool for our company, but the new design takes our brand to the next level," says Paul Storch, President of Felix Storch, Inc. "The new layout is not only more attractive, but has also been designed to meet the specific needs of both our vast product line and our detail-oriented customer base." The new website maintains the same web address as the previous summitappliance.com. The site was developed and designed to be compatible with current browsers and mobile devices. Product pages can be shared via email and other social media outlets. Bronx, NY, March 3, 2015—Felix Storch Inc., a manufacturer and distributor of specialty appliances, has received ISO 9001:2008 certification for its management systems, standards, and guidelines. The company has been serving the residential, medical, commercial, and hospitality markets since 1969. "As our company grows with each product development and new customer, it is vital to our business to maintain the highest level of quality in our output and operations," says Paul Storch, President of Felix Storch, Inc. "The ISO quality principles will help our staff maintain a quality system with a powerful customer focus." To obtain ISO 9001:2008 certification, FSI’s management and administration system was evaluated by QAS International, a certification system that has been operating internationally for over twenty years. Felix Storch, Inc., was approved as an OEM manufacturer of specialty major appliances for the medical, commercial, hospitality, and residential markets. ISO 9001:2008 is the latest of the 9001 quality management standards set by the International Organization for Standardization (ISO). For this certification, a company must meet a variety of requirements in their quality system, including documenting procedures, monitoring output for defects, applying corrective action, regularly reviewing the quality system, and striving for continuous improvement. In addition to ISO 9001:2008 certification, Felix Storch, Inc., is currently in the process of achieving ISO 17025:2005 certification through Perry Johnson Laboratory Accreditation, Inc., for its in-house laboratory under its Accucold division. May 27, 2014--Felix Storch, Inc., was pleased to be featured in the New York Daily News for recognition of its hiring practices. Since 2012, Felix Storch, Inc. (FSI), has been employing dozens of entry level staff members through its collaboration with Jericho Project, a nonprofit that provides housing and employment services to the homeless. Based in midtown Manhattan, Jericho Project offers workshops and job training sessions to homeless individuals before coordinating their employment with companies like FSI. Through their Veterans Initiative, Jericho Project has helped over 550 veterans find housing and employment opportunities, including some at FSI. FSI has also benefited greatly, as its partnership with Jericho Project has grown its workforce with quality employees. You can read the full article here. 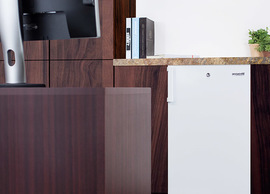 Bronx, NY, April 28, 2014—Summit Appliance, a division of Felix Storch, Inc., continues to expand its virtually endless line of undercounter appliances with choices in 12”, 15”, 18”, 20”, 24”, and 30” widths. Since introducing its built-in product line, Summit Appliance has become one of the industry’s largest manufacturers of undercounter appliances, offering all-refrigerators, frost-free and low temperature all-freezers, refrigerator-freezers, wine cellars, and drawer units. Doors can be customized in stainless steel or integrated door frames designed to accept customer supplied overlay panels. "We carry a wide assortment of the standard cutouts sizes—24” x 24”—that are very easy to integrate in a pre-designed kitchen or suite," says Steve Ross, Vice President of Felix Storch, Inc. "Over the last few years, we’ve also seen an increasing demand for slimmer appliances." The smallest of these units is Summit Appliance’s SWC1224, a built-in wine cellar sized at just 12” wide. 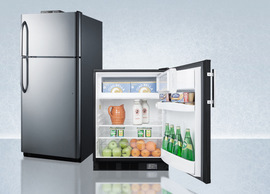 Other popular models include the CT66BBISSTB, a refrigerator-freezer constructed in Europe and finished with a 304 grade stainless steel wrapped door. Like most of Summit Appliance’s undercounter line, this unit can be ordered in a lower 32” height to fit under counters complying with ADA guidelines for accessibility. 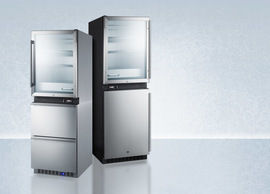 Summit Appliance will be displaying these model at the upcoming HD Expo (Booth 3443). For more information, visit summitappliance.com or call 1-800-932-4267. Bronx, NY, April 3, 2014—Glass door refrigerators are getting an energy efficient makeover with Summit Appliance’s new tinted door options. Available in four styles, these tints help to prevent light from damaging stored items, thereby reducing energy consumption and saving on running costs. "Many wine enthusiasts love to display their collections behind glass doors, but this puts every bottle in a vulnerable place," says Paul Storch, President of Felix Storch, Inc. "Even double or triple pane glass will allow some light to penetrate the door. This forces the refrigerator or wine cellar to work harder to maintain its temperature." Summit’s door tints are designed to help combat the harmful effects of natural and artificial light. Using Clear Distortion Free adhesive technology, reflective or low-e film is applied directly to the glass doors of any Summit beverage center or wine cellar. Four different color options provide a range in energy savings and interior visibility. A mirror finish in low-e film allows maximum energy savings, rejecting 85% of solar energy and reducing glare by 87%. Blue tints come in two styles: a midnight blue finish with 69% solar energy rejection and glare reduction, and a lighter blue that provides more interior visibility. For the customer looking for moderate protection, Summit offers a light smoke tint that keeps stored items in view. All options reject up to 99% of UV rays. "There are some applications where a door tint can be absolutely vital to cold storage," says Storch. "When a refrigerator is placed in direct sunlight, a tinted door will offer noticeable improvement in its temperature performance. On the other hand, some customers just love the look." Bronx, NY, June 13, 2014—Having manufactured and distributed major specialty appliances since 1969, Felix Storch, Inc., is now expanding its design division with a U.S. patent for its 'C-Hood' ventilation project. "Over the years, many of our customers have asked for more solutions to venting smaller built-in microwaves," says Paul Storch, President of Felix Storch, Inc. "Most of what they find on the market is aimed at the standard American kitchen, which is simply too large for our niche customers with space constraints." Through its Summit Appliance division, Felix Storch, Inc., caters to the more unique needs of smaller living spaces. In 2012, the company decided to pursue the development of a proprietary 24" wide 'C-Hood,' a stainless steel 'c' shaped cabinet designed to hold a microwave and provide air filtration through a recirculating process. On June 3, 2014, Felix Storch, Inc., was awarded a United States Design Patent for this project. "When it comes to the small kitchen market, every inch of space counts," Storch says. "Being able to house a microwave under your cabinet frees up counter space, something that can be a true luxury in tight apartment kitchens." Bronx, NY, January 13, 2014—Summit Appliance is expanding its collection of built-in undercounter appliances with a new two-drawer refrigerator-freezer. 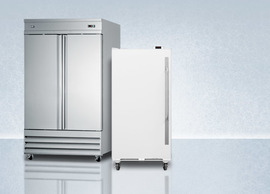 Sized for 24” wide cutouts, the SPRF2DIM offers the complete convenience of a separate refrigerator and freezer section, a rare design feature on drawer units. The exterior is fully wrapped in 304 grade stainless steel, with slim handles designed to match many popular styles of residential cabinetry. Both sections utilize frost-free operation to eliminate the manual defrosting process. Additional features include a digital thermostat, interior light, and factory installed icemaker. The SPRF2DIM measures 34” H x 23.75” W x 24.25” D and can be installed built-in under standard counters or used freestanding. To learn more about this unit and Summit’s complete line of built-in appliances, visit summitappliance.com or call 1-800-932-4267. 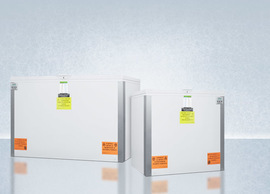 Bronx, NY, April 29, 2013— In continuing its development as a leading supplier of medical equipment, Felix Storch Inc., will be launching a new product line of IEC and ETL-listed blanket warmers for hospital use. Manufactured under the new brand PureTherm™, this warming cabinet series is expected to be available in the summer of 2013, with all production taking place in the U.S. facilities of Felix Storch, Inc.
Best known for its refrigeration and freezer line, Felix Storch Inc., currently manufactures and distributes medical grade appliances primarily through its Accucold® brand. The new PureTherm™ blanket warmers have already passed the IEC 61010-1 standard for laboratory use of electrical equipment. This series comes in a modular design, with all warming components and the digital thermostat housed in an upper compartment to maximize capacity and ensure easy maintenance. 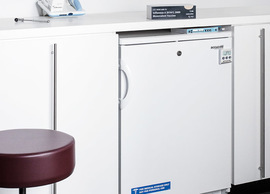 The first model available is mid-sized warming cabinet PHC115G, with a double pane tempered glass door that offers a display all the way down to the floor. This model features a stainless steel interior for improved sanitation, as well as a digital thermostat, cantilevered shelving, and a self-closing door. An undercounter model is expected to be available later this year. Several more sizes and options, including built-in capable units, are expected to be available later this year. All PureTherm™ warming cabinets can also be customized with a variety of interior and exterior features, including 3” or 6” casters and alternative exterior finishes. 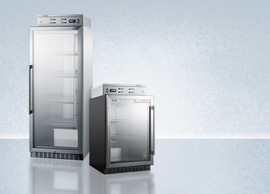 To learn more about the PureTherm™ line, including pricing and availability, call us today at 718-893-3900 or visit medicalrefrigerators.com/puretherm. "The Ingenious Collection has a dramatic look, yet the units themselves are incredibly practical," says Paul Storch, President of Felix Storch, Inc. "The curved doors and platinum color are quite stylish, while the actual product features are designed for true user convenience." Those features include a digital control panel on the door's exterior that lets users set an open door alarm, reduce the energy consumption for short holidays, and set the Power Cool function to rapidly chill the interior (ideal for bringing room temperature items like groceries to a colder temperature). 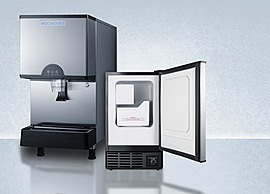 The freezer compartment includes the Smart Fill Ice Factory, a no-spill system for making ice cubes, and the Express Chill Zone, a rapid cooling compartment that can be programmed on a timer-based system. Additional features include glass shelves, door storage, interior lighting, and multiple crisper storage drawers. "When you’re looking for a counter deep refrigerator, your options are generally limited to wider units that take up too much space or built-in models that come with a very high price tag," Storch says. 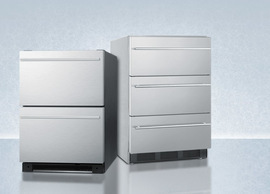 "Because of their height, the Ingenious models manage to maintain full-size storage capacity in slimmer widths than what you generally find when looking for counter deep units. They also come at a much lower price than the built-in models on the market." The units available are the 18 cu.ft. FF1935PL (73” H x 29.25” W x 27” D) and 14 cu.ft. FF1525PL (73" H x 26" W x 26.25" D). 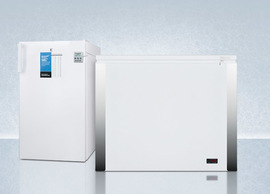 To learn more about these units and see the Ingenious features in action, visit summitappliance.com/ingenious or call Summit at 1-800-932-4267. August 30, 2010--SUMMIT Appliance has launched three new RSS feeds to keep dealers updated on product changes. Customers may subscribe to updates on new products, out of stock listings, and updates to any existing product data, including new photography or specification changes. June 4, 2010, Bronx, NY--Felix Storch Inc. congratulates its staff on graduating from a yearlong training program with NYC Department of Small Business Services (SBS). For the second year in a row, employees of SUMMIT Appliance participated in on-site training with weekly courses in a broad curriculum. "We viewed this opportunity as an investment, both in our individual employees and our whole company's growth," said Paul Storch, Vice President of Felix Storch Inc. "An educated workforce helps us improve every aspect of our day-to-day output because each employee has the skills to contribute more efficiently." Over the past year, production, warehouse, and customer service staff members studied industry-specific subjects that included lean manufacturing and quality control. Employees also worked to improve their language and math skills, taking classes in ESL and remedial to advanced mathematics. Sixty-four employees participated in both traditional classroom activities and more hands-on training including hipot testing and forklift safety. The program was funded by a $242,919 grant from NYC Business Solutions Training Funds, which was matched by a $202,750 employer contribution. SBS is dedicated to keeping local businesses competitive while providing entry-level workers with career advancement opportunities. With an extensive product line that requires precise in-house customization, SUMMIT Appliance has a special demand for skilled employees in the mechanical field. "We do our best to keep as much production in the city as possible, resulting in minimal lead time and faster deliveries," adds Storch. "The more rounded our employees are, the better we can provide for our customers." March 26, 2010, Bronx, NY--Summit Appliance launches the next generation website for its medical division of refrigerators, freezers, and ADA compliant major appliances. Following the successful redesign of www.summitappliance.com in August 2009, the new summitmedicalrefrigerators.com features brand new product photography and printable two-page brochures. Users can search for products by general size and type, or use specific filters to narrow search results by features. The new website also includes additional resources for medical users, including series-specific guides on Summit models and a series of articles on vaccine storage and handling. "We carry one of the most comprehensive medical lines of refrigeration in the industry," said Paul Storch, Vice President of Felix Storch, Inc. "Our new website should make finding the right product for our customers a direct and easy process." 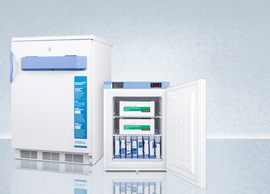 Also featured on the new website is Summit Appliance's Accucold division of scientific refrigeration, a line exclusively designed for the storage of vaccines and medical goods. 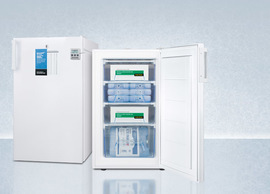 Visit summitmedicalrefrigerators.com to explore the new website and product lines. 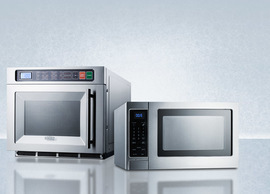 Since 1969, SUMMIT Appliance, a division of Felix Storch, Inc., has been a leading manufacturer and distributor of major appliances for commercial, household, medical, and laboratory use, including the industry's largest selection of built-in under counter refrigeration and a complete series of ADA compliant models. 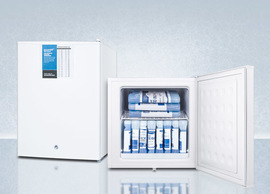 February 11, 2010, Bronx, NY--SUMMIT Appliance introduces ACCUCOLD™, a new line of compact and under counter refrigeration designed to store vaccines, pharmaceuticals, and other specimens at precise temperatures. 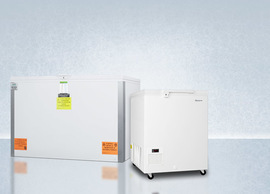 Ideally sized with 24" footprints or compact cube dimensions, SUMMIT ACCUCOLD™ all-refrigerators and all-freezers are specially featured with advanced upgrades most requested by the laboratory community. Front locks, high temperature alarms with external temperature displays, hospital grade plugs, and self-closing doors are standard, with internal fans and heat sinks installed on all refrigerators. All SUMMIT ACCUCOLD™ models are U.L. approved and meet commercial and CalCode standards. 24" wide built-in capable models are also available in a 32" high version to fit under lower ADA compliant counters. 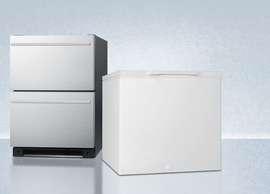 For more information, visit SUMMIT Appliance online at www.summitmedicalrefrigerators.com or call 718-893-3900. Since 1969, SUMMIT Appliance, a division of Felix Storch, Inc., has been a leading manufacturer and distributor of major appliances for commercial, household, medical, and laboratory use, including the industry's largest selection of built-in under counter refrigeration and a complete series of ADA compliant units. March 24, 2010, Bronx, NY--Bottled beer reaches new depths of ice cold refreshment in Summit Appliance's unique series of Cold Cavern™ beer frosters. 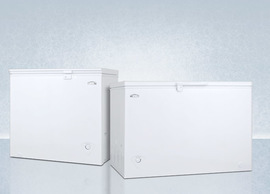 These compact and counter height freezers are designed exclusively to hold cans and bottles at 24ºF, beer's lowest point before freezing. Bottles get so cold, they literally "frost" over when removed from the unit, keeping the beer inside at a near-freezing temperature. While many ales and darker brews are traditionally served at warmer temperatures, domestic lights are generally enjoyed as cold as possible. "For a lot of beer drinkers, there's just nothing more refreshing than an ice cold beer," says Paul Storch, Vice President of Summit Appliance. "A beer froster gives you the same sensation you get in a frosted glass, but lets you keep beer in the bottle. It's more convenient for home entertaining." Beer frosters are available for commercial or home use, with options in automatic defrost and with stainless steel doors. Summit Appliance beer frosters include original door decals with high resolution imagery and text options for English and Spanish speaking markets. In addition to beer frosters, Summit Appliance carries an extensive line of beer dispensers, wine cellars, and general and specialty refrigeration. To learn more, visit summitappliance.com or call 718-893-3900. 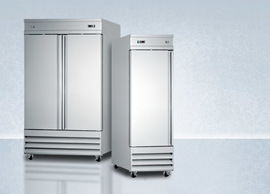 Since 1969, Summit Appliance has been a leading manufacturer and distributor of major appliances for commercial, household, medical, and laboratory use, including the industry's largest selection of built-in undercounter refrigeration and a complete series of ADA compliant units. January 14, 2010, Bronx, NY--Vaccines are sensitive biological substances that can become less effective, or even destroyed, when exposed to temperatures outside the recommended range. That's why these materials must be stored properly from the time they are manufactured until they are administered, a challenge many medical facilities face when transporting pharmaceuticals or providing mobile health care services. 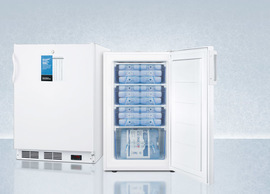 To address this need, SUMMIT Appliance, a leading manufacturer and supplier of medical refrigeration, has introduced the SPRF26M, a portable 12/24 volt refrigerator/freezer designed for the safe and stable transport of vaccines, pharmaceuticals, and other specimens that require consistent temperature conditions. SUMMIT SPRF26M utilizes a powerful compressor designed to maintain precise temperatures at refrigerator or freezer levels (-18ºC capable). For portable use, this unit can be plugged into the 12V DC lighter socket inside any vehicle or 24V battery source to allow stable temperature control on the road. An AC adapter is also included for alternate use in 110V electrical wall outlets. "Medical storage requires a more advanced design than an everyday cooler," says Steve Ross, Vice President of Marketing for SUMMIT Appliance. "Solid construction and true insulation are essential, and the SPRF26M's resilient plastic body is built to hold up to rugged use." For further safety, the SPRF26M includes a digital thermostat with external temperature readout. This feature helps to limit the time contents spend exposed to ambient temperature, as users can monitor the temperature without opening the lid. 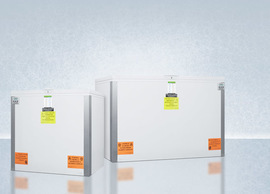 In addition to temperature stability, SUMMIT SPRF26M is specifically featured for professional storage in medical applications. A keyed chrome lock allows more security for storing sensitive materials, a serious consideration when administering certain vaccines or collecting samples in the field. SUMMIT Appliance also provides a wheeled trolley for smooth mobility when transporting the unit. 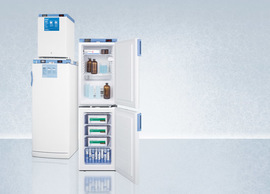 To learn more about this model, visit www.medicalrefrigerators.com/product/SPRF26M or call 718-893-3900. November 6, 2009, Bronx, NY-- Household, commercial, and outdoor beer dispensers have long been a staple of Summit Appliance's product line, with 24" wide units in black, brass, and stainless steel. Now, Summit Appliance brings the option of textured diamond plate to doors on single, double, and triple tap beer dispensers. This aluminum finish can be applied to freestanding or built-in units in Summit Appliance's SBC490 line of auto defrost beer dispensers. All models can accommodate half, quarter, and mini kegs and come with a complete tap kit and CO2 tank. Household and commercial units feature a black cabinet and include a curved towel bar handle in polished stainless steel. "We've seen the diamond plate design everywhere from commercial garages to carefully furnished man caves," says Paul Storch, Vice President of Summit Appliance. "It's a natural look for beer dispensers because it brings rugged style to a product normally confined to stainless steel or solid black." The wrapping is rustproof and can also be ordered on under counter refrigerators and freezers from Summit Appliance. To learn more, visit summitappliance.com or call 718-893-3900.